Taylor Swift's new album "reputation" has appeared on Apple Music and Spotify internationally, nearly three weeks after release —with a U.S. release likely imminent. 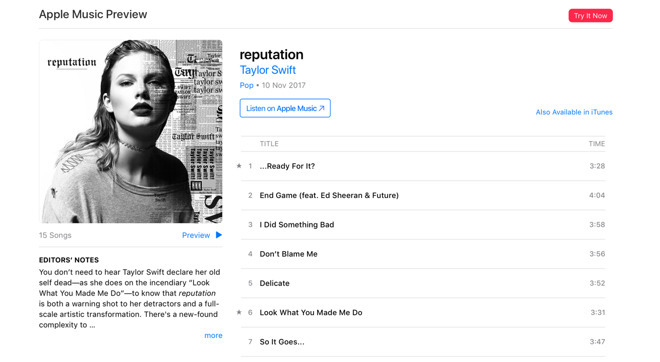 "Reputation" was released on Nov. 10 by digital download or at retail at Target. Upon release, reports circulated that Swift's management team was still negotiating with streaming music services. The album consists of 15 tracks, and will be available both on Apple Music and from the iTunes Music Store. At present, only one track is available in the U.S. According to Nielsen SoundScan, Reputation sold 1.216 million copies in the US during its first week, becoming 2017's best-selling album in the country, with 2 million copies sold worldwide. Swift has been a frequent critic of streaming services, arguing that they devalue both her music and other artists. She also wrote an open letter complaining about Apple's plans to skip royalties during three-month Apple Music trials. As a result, Apple quickly reversed its previous stance on the matter.